Potatoes are a really versatile vegetable that are often used as a side dish for a main meal. They can be mashed, roasted, chipped, sautéed and baked. Cooked potatoes can be placed in the freezer and easily prepared ahead of time. If you prefer the potatoes just to be pre-peeled and cooked fresh, this is also a time-saving option that can be used. 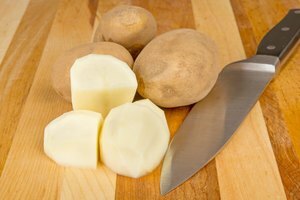 If you are only preparing food a day ahead, pre-cooked potatoes can simply be kept in the refrigerator and then there is no need for defrosting. Here are the best ways we recommend whipping them up! Wash all your potatoes that you are going to use. Place them on a chopping board. Take your potato peeler and peel each potato well. You can use a sharp knife if you prefer. Wash all the potatoes again and then place in large pot of cold water ensuring that all the potatoes are covered. Add a pinch of salt and a couple of drops of lemon juice. 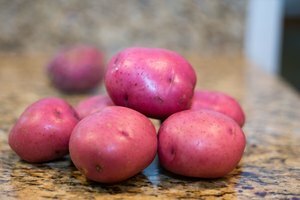 Placing the potatoes in the water will stop them from going brown and you can leave the potatoes in water for up to 48 hours so that they are ready to use. Place 1 1/2 pounds of potatoes in a saucepan with 1/2 tsp of salt. Add water until potatoes are completely covered. Place the saucepan on the stove and put on high heat. Bring the water to a boil and then reduce to medium heat and simmer for 15 to 20 minutes. Check the potatoes are done by placing a fork in them, if the fork slides through the potato easily, they are done. Drain the potatoes. Place cream and butter in a saucepan and warm until the butter has melted. Put the potatoes in a large bowl and add the warm melted butter and cream. Mash the potatoes, adding a little milk to make them creamier. Keep mashing until you achieve the consistency you desire. Add salt and pepper to taste. Let the mashed potato mix cool and then place in a airtight plastic container with a lid. Make sure the lid is sealed properly. Place the container in the freezer. When you want to use them, take the container out of the freezer and place it in the refrigerator the night before. You can then warm in the microwave for a couple of minutes or place in a dish in the oven set to 350 degrees Fahrenheit. The warming process will take approximately 30 to 40 minutes. Prepare roasted potatoes using any method you prefer. After they have nearly completed the cooking process, then place them on a paper towel to soak up any excess oil. Do not allow them to fully cook or when they are reheated they will become mushy and will not keep their firmness. Place them in an airtight plastic container with a lid and place in the freezer. Use the same method of thawing and reheating as the mashed potatoes. You can par-cook french fries, simply cook them as usual but just until they are very slightly brown. Let them cool and place in a freezer bag or container. When you are ready to use let them thaw in the fridge and then place them in hot oil to re-heat and finish. 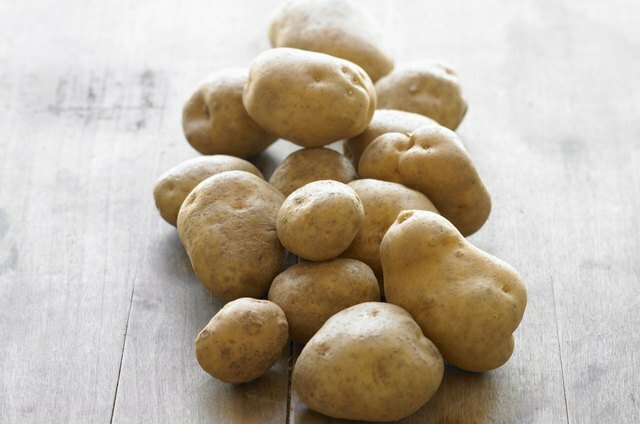 Potatoes freeze better when they have been cooked or even par-boiled first. 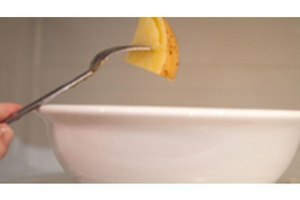 Raw potatoes do not freeze as well.